fun features: Ask the Experts section at the front of the book in which common food-allergy related questions are answered. Fun tips on pages throughout the book such as Easy Ways to Make Any Snack Special, Recycle Your Favorite Foods! Five Ideas for Leftovers, Five Fun Ways to Serve Fruit, and All About Sugar. There are also Cooking with Kids pages tucked here and there with basic techniques and ideas that encourage you to get the kids involved in the kitchen with topics such as Teach Your Child to Melt Chocolate, Teach Your Child to Shape Gnocchi, Teach Your Child How to Juice and Zest a Lime, Teach Your Child to Roll Out Pizza Dough, Teach Your Child How to Bake a Sweet Potato, and Teach Your Child to Frost a Layer Cake. my thoughts/review: I consider myself very fortunate that I don't have any food-allergies in my family. As a mother, I can only imagine how scary that must be. That said, over the years, my kids have had friends in class with food-allergies (mostly nut) and so I'm not completely ignorant of the fact that they exist and they are serious. I've found this book to be a fantastic resource in helping me familiarize myself with "options" that I can include when cooking/baking for someone with food allergies. But what's even better, is that this book is filled with food that I would (and will) make anyway because it sounds and looks great. It is also filled with fantastic tips, suggestions, and advice. It includes a section in the back of the book entitled Building a Natural, Allergy-Free Pantry that lists a number of things you can keep in your pantry with allergy-free cooking in mind. The majority of these things are basics that I already keep in my pantry such as dried beans and legumes, grains, fats, and dried fruits, nuts, and seeds. But also included are ingredients that may not normally be in a house that isn't required to think about food-allergies on a regular basis such as Xanthan Gum, Sorghum flour, and gluten-free oats. 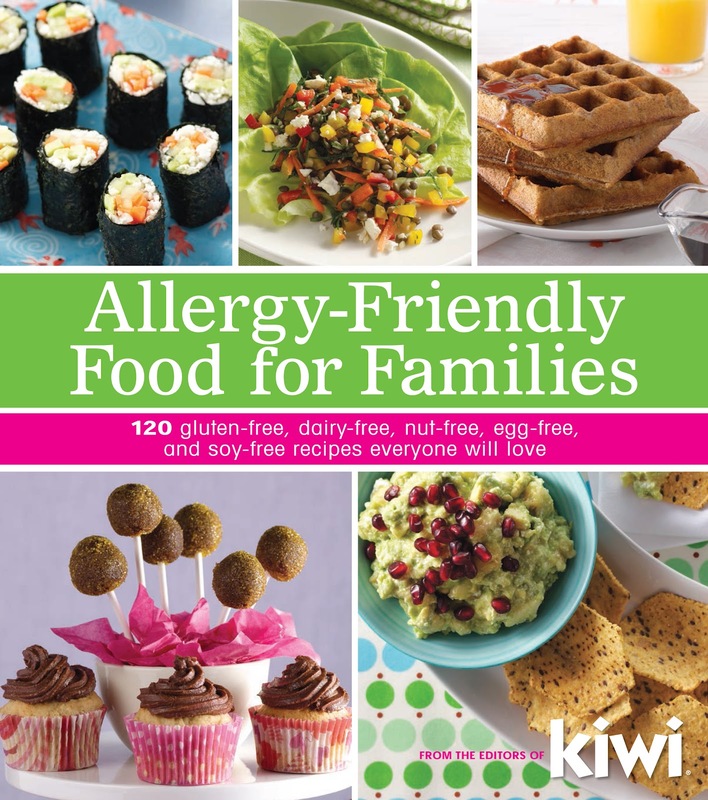 Although there are more food-allergies out there, this book focuses on the five most common food allergens - gluten, dairy, nuts, eggs, and soy. Each recipe page has bold, colorful markers down the side indicating which allergens the recipe is free of (labeled with gluten-free, dairy-free, soy-free, nut-free, egg-free). Many recipes include "options" in which easy substitutions are listed to make it safe for a particular allergen. Another great thing is that aside from the regular Index in the back of the book, there is also a Recipe Index by Allergen so that you can easily scroll through and find the recipes safe for a particular type of food-allergy. I've tried two recipes so far, but don't plan on stopping there. I can't wait to explore some of these new-to-me styles of recipes. I would recommend this book for any level cook, especially one cooking with and for children, and those concerned with food-allergies (of these 5 varieties), or just someone who likes good food, educating themselves on this subject, and being prepared (because you never know). Preheat oven to 350° F. Line a baking sheet or two with parchment paper. Line the cheese slices up on the prepared baking sheets, leaving about an inch or so in between each. Bake for 10-15 minutes, or until cheese is golden-brown all over with crispy edges. While the cheese is baking, stir together all of the ingredients for the bean salsa (salt, pepper, olive oil, and lime juice to taste). When cheese is done, use a thin spatula to remove it to a tray lined with a couple layers of paper toweling to absorb any excess fat. 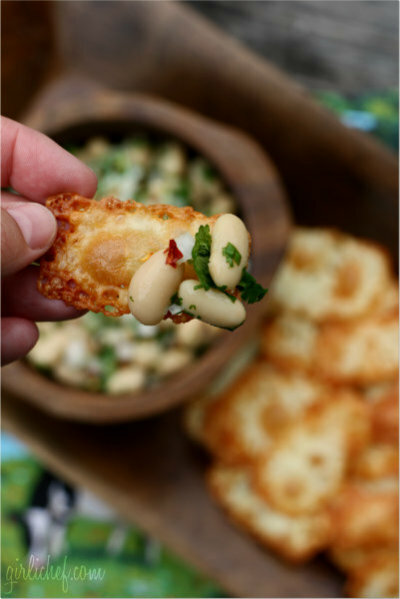 When cool, serve crispy cheese bites with bean salsa. about the authors: Parents trust KIWI to help them raise their children and enjoy their lives in the healthiest way possible. They also know that KIWI is ahead of the curve when it comes to a green and organic lifestyle, so they can count on our trusted brand and initiatives to sift through and provide only the best news, advice, and products. KIWI understands that achieving the right balance between the ideal world and the real world can be difficult, so readers never feel scolded, only supported. KIWI helps parents make the best choices about health, food, home life, and more, so they can feel good about their families and the future. cheese as chips! love it, great pick! Food allergies are a complete nightmare. A lot of times I find myself cooking something separate for Jackson because he can't have what we're having. And traveling with a kid that has food allergies....really not fun! You lose so much control when you're in a restaurant. Anyway, this book looks great. I should probably order it! Kim, I was actually thinking of you when I wrote this post and was gonna shoot you an email about the book when I got a minute. I think you'd enjoy it! And there's some fantastic whole-family meal ideas, as well that are nut-free!! I've always been thankful that food allergies weren't a problem for my daughter and granddaughters. Love the bean salsa - so healthy! If there's one thing I REALLY hope, it's that my kids don't have food allergies. But if they do, at least I know that I'll be well equipped to handle them since I'm not afraid to get experimental in the kitchen. This book sounds like an awesome guide to helping you deal with and cook with them! crispy cheese bites with bean salsa! 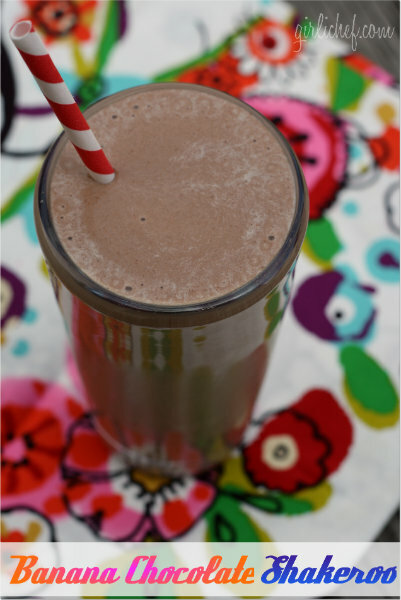 This looks outrageously delish. Can't wait to try it this weekend. Thanks!! 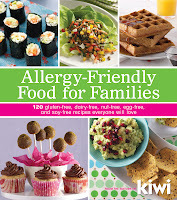 I am excited to try this cookbook out too...as you may know, we are a food allergy family! 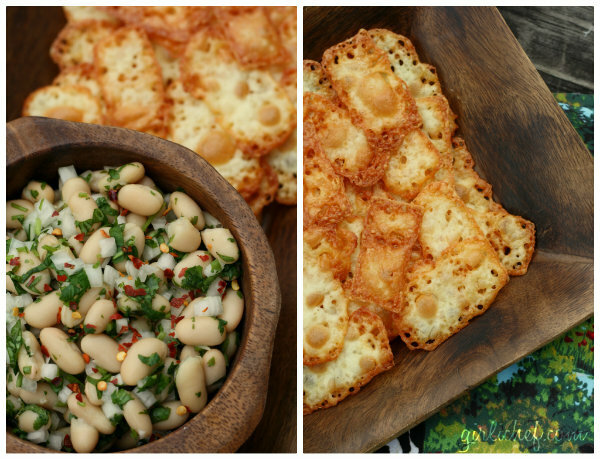 I make 'cheese crisps' too, but dairy free, and they would be good here...that bean dip looks fab! Ok this chips are pure evilness! I love them!